Written by Dr. Mohan Krishna and medically reviewed by iCliniq medical review team. Osteoarthritis can affect any joint in the body. It is like wear and tear which develops over many years. It is common in people over 50 years of age, particularly in women. Both knees need not to be affected at the same time. Changes to articular cartilage and tears of the menisci. In the beginning there may be some discomfort after a long walk or exertion. Later stages: Stiffness after rest / sitting for some time and early in the mornings. As the condition progresses, pain can interfere with simple daily activities and can disturb sleep. Muscles may become weak and thin. *Patient may also develop bow legs or knock knees. Sportsmen who played contact sports. Previous injury to the knee. Occupations involving prolonged squatting or kneeling, carrying heavy weights regularly, repetitive strain to knees. Crystal Deposits such as uric acid in the joint is a chemical risk factor and may damage the joint fast. Treatment depends upon the stage of the OA. It cannot be cured at once but one should not consider this as a disease. We can slow down the progression of the disease and to make life more comfortable. Medications – To control pain and to nourish cartilage (dietary supplements). Topical Creams/gels - Topical creams provide an alternative to oral medications. 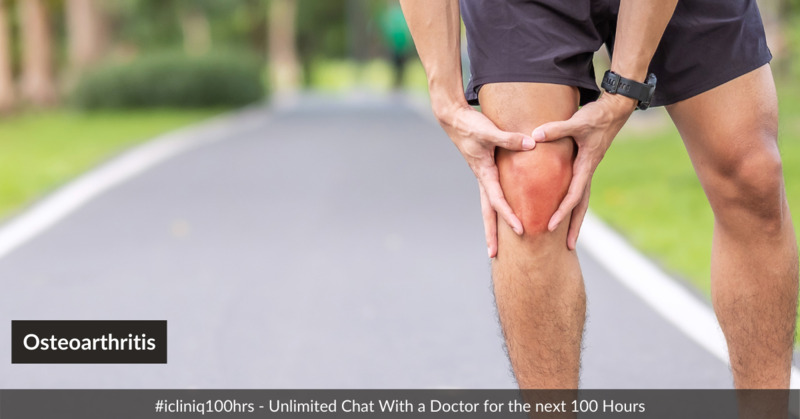 Do you have a question on Osteoarthritis or Osteoarthritis Of Knee?